We know that many ancient peoples practiced tattooing, based on the body art we see represented in figurines and wall carvings. But these tattoos found on the skin of the mummified 5,000-year-old body of Ötzi the Iceman reveal that body art wasn't just ceremonial. Over at Archaeology magazine, there's a fantastic article on ancient tattoos, many of which were incredibly elaborate. But perhaps most fascinating are the tattoos on Ötzi. Partly that's because they are our only examples of real-life ancient tattoos. Every other example of ancient tattoos comes from art, and we can't be certain that they show actual tattoo patterns or an idealized version of them. 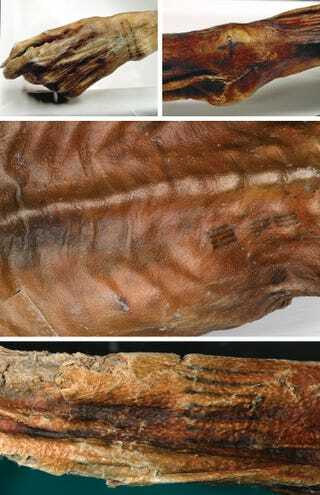 Ötzi's markings reveal how tattoos were made, at least in Copper Age Europe. And they hint at why they were made, too. Ötzi’s clothing, tools, and weapons are a remarkable window into the life of a herder or perhaps a chieftain in Copper Age Europe. But it is Ötzi’s body itself, almost perfectly preserved by the snow and ice that covered him shortly after his death, that provides unique evidence of early medicine. Ötzi is covered with more than 50 tattoos in the form of lines and crosses made up of small incisions in his skin into which charcoal was rubbed. Because they are all found on parts of the body that show evidence of a lifetime of wear and tear—the ankles, wrists, knees, Achilles tendon, and lower back, for example—it’s thought that Ötzi’s tattoos were therapeutic, not decorative or symbolic. When Ötzi was first studied, archaeologists were shocked because they had never before seen Copper Age tattoos, and because acupuncture as a treatment for joint distress, rheumatism, and arthritis was thought to have originated in Asia more than 2,000 years later. Of course we can't be absolutely sure why these tattoos were placed in those locations. It's possible Ötze's people believed those regions of the body were spiritually significant. Still, it's very possible that this was an early effort at acupuncture. You can read more about ancient tattoos at Archaeology magazine.